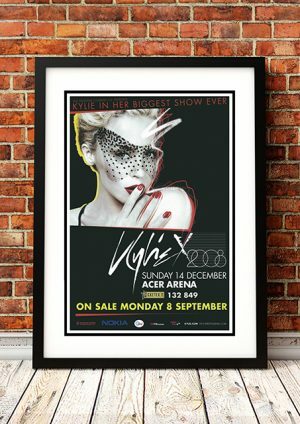 Classic Kylie Minogue Band Concert Posters and Memorabilia! Buy Online Now! Kylie Minogue started her long career as actress on an Australian soap, but her charisma and chameleon-like talents as a pop singer soon landed her on top of the music world. The ride was bumpy, with high highs (chart-topping singles and albums, a brilliant collaboration with Nick Cave) and low lows (cancer, being dropped by record labels), but through it all, Minogue‘s cheerful relatability never flagged. Through her early days in the ’80s with Stock, Aitken & Waterman to her giant electro pop hit in 2001 (“Can’t Get You Out of My Head”) to her triumphant worldwide tours in the 2010s, Minogue carved out space in the upper echelon of pop all her own. We stock some awesome Kyle Minogue Band Concert Posters.